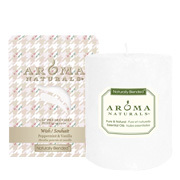 Pillar Candle: Aloha Bay, Aroma Naturals, Auroshikha, Honey Candles! Naturally Blended Pillar 2.5" x 4": Naturally Blended enhance your experience, lift your spirits and comfort the mind all while decorating your favorite room or work environment. The blends of essential and natural oils uplift, revitalize, invigorate filling rooms and your mood with brightness and warmth. Our hand-poured Naturally Blended Collection is made of food-grade paraffin and vegetable waxes with blended essential and natural oilsdelivering authentic aromatherapy benefits. Naturallly Blended are both functional and therapeutic and are founded on the belief that pure plant and flower aromas enhance well-being. Live and celebrate with natural candles that refresh your space. 2.5" x 4". 50 hours approximate burn time. ORDER NOW! • Ambiance (Orange Lemongrass): (Color: Lemon) A revitalizing blend of sweet, radiant Orange is combined with refreshing, energetic Lemongrass. 2.5" x 4". 50 hours approximate burn time. ORDER NOW! • Meditation (Patchouli, Frankincense): (Color: Pearl) Beautiful hand-poured crystal glass magnifies the alluring glow of the flame. Patchouli is grounding and balancing while Frankincense has been use in spiritual settings for over 3,000 years. Together they are meditative and mystical. 2.5" x 4". 50 hours approximate burn time. ORDER NOW! • Peace Pearl (Orange, Clove, Cinnamon): (Color: Pearl) A traditional favorite. 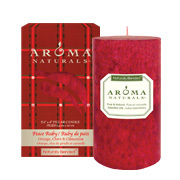 Sweet uplifting Orange, revitalizing Clove and spicy Cinnamon fills your home with comfort and warmth. 2.5" x 4". 50 hours approximate burn time. ORDER NOW! • Relaxing (Lavender, Tangerine): (Color: Tangerine) Lavender is one of the most calming essential oils. 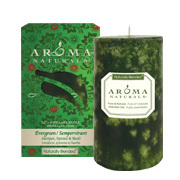 In combination with soothing Tangerine, this is a peaceful aroma to reduce stress. 2.5" x 4". 50 hours approximate burn time. ORDER NOW! Naturally Blended Pillar 2.5" x 4": Naturally Blended enhance your experience, lift your spirits and comfort the mind all while decorating your favorite room or work environment. The blends of essential and natural oils uplift, revitalize, invigorate filling rooms and your mood with brightness and warmth. Our hand-poured Naturally Blended Collection is made of food-grade paraffin and vegetable waxes with blended essential and natural oilsdelivering authentic aromatherapy benefits. Naturallly Blended are both functional and therapeutic and are founded on the belief that pure plant and flower aromas enhance well-being. Live and celebrate with natural candles that refresh your space. • Evergreen Holiday (Pine Fir Spruce): Perfect to enhance any home with green aromas of cleansing Juniper, fresh and calming Spruce along with relaxing Basil create a fresh green room in any space. Brighten your holiday with invigorating Pine, Fir and Spruce. Experience the natural aroma of a fresh cut Christmas tree. Color: Dark Green. Approximate burn time is 50 hours. ORDER NOW! 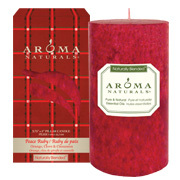 • Peace Ruby Holiday (Orange Clove Cinnamon): Sweet, uplifting Orange, revitalizing Clove and restorative Cinnamon have been traditionally used to relieve stress and provide comfort in the home. This festive favorite is both uplifting and revitalizing while bright Orange soothes and calms. Color: Red. Approximate burn time is 50 hours. ORDER NOW! • Wish Holiday (Peppermint Vanilla): Peppermint revives and lifts the spirits while Vanilla is comforting and enticing. Loved for its calming and familiar warm aroma, Vanilla is the under-note mixed with the refreshing and stimulating Peppermint. Color: Snowflake White. Approximate burn time is 50 hours. ORDER NOW! Naturally Blended Pillar 2.75" x 5": Naturally Blended enhance your experience, lift your spirits and comfort the mind all while decorating your favorite room or work environment. The blends of essential and natural oils uplift, revitalize, invigorate filling rooms and your mood with brightness and warmth. Our hand-poured Naturally Blended Collection is made of food-grade paraffin and vegetable waxes with blended essential and natural oilsdelivering authentic aromatherapy benefits. Naturallly Blended are both functional and therapeutic and are founded on the belief that pure plant and flower aromas enhance well-being. Live and celebrate with natural candles that refresh your space. • Peace Ruby Holiday (Orange Clove Cinnamon): Sweet, uplifting Orange, revitalizing Clove and restorative Cinnamon have been traditionally used to relieve stress and provide comfort in the home. This festive favorite is both uplifting and revitalizing while bright Orange soothes and calms. Color: Red. Approximate burn time is 70 hours. ORDER NOW! 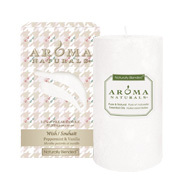 • Wish Holiday (Peppermint Vanilla): Peppermint revives and lifts the spirits while Vanilla is comforting and enticing. Loved for its calming and familiar warm aroma, Vanilla is the under-note mixed with the refreshing and stimulating Peppermint. Color: Snowflake White. Approximate burn time is 70 hours. ORDER NOW! Spirituals Pillar 3" x 6": Pure, simple, elegant and handcrafted for your sacred personal indulgence with a beautiful silk screened design. Our Pure and Natural core is made of 100% Soy VegePure® waxes, which offer a wonderfully clean, cool and long lasting burn. 3" x 6". Approximate burn time is 100 hours. ORDER NOW! • Eternal Love: (Fuji & Passion Fruit) Sacred Heart: Eternal love, joy and compassion. The discovery of a soul mate. Color: Ruby Red. ORDER NOW! • Power: (Amber, Sandalwood & Lavender) Dragon: Power, immortality, happiness and creation. Color: Black. ORDER NOW! Eco Palm Wax Pillar Candle: Eco Palm Wax™ with organic palm wax. All scented pillar candles contain only 100% pure essential oils. 3" x 3½". ORDER TODAY! • Cranberry: Pure Botanical Extracts Lemon - Sweet Orange. 3" wide by 3½" tall - scented. ORDER NOW! • Holiday Spice: Cassia - Balsam Fir - Nutmeg - Clove - Orange. 3" wide by 3½" tall - scented. ORDER NOW! • Mountain Mist: Cedar - Rosemary - Canadian Fir - White Pine. 3" wide by 3½" tall - scented. ORDER NOW! CANDLES: Eco Palm Wax Pillar Candle, 3" x 3½"
Eco Palm Wax Pillar Candle: Eco Palm Wax™ with organic palm wax. All scented pillar candles contain only 100% pure essential oils. 2¼" x 6". ORDER TODAY! • Cranberry: Pure Botanical Extracts Lemon - Sweet Orange. 2¼" wide by 6" tall - scented. ORDER NOW! • Holiday Spice: Cassia - Balsam Fir - Nutmeg - Clove - Orange. 2¼" wide by 6" tall - scented. ORDER NOW! • Mountain Mist: Cedar - Rosemary - Canadian Fir - White Pine. 2¼" wide by 6" tall - scented. ORDER NOW! • Vanilla Bean: Orange - Lavandin - Natural Vanilla Extract. 2¼" wide by 6" tall - scented. ORDER NOW! • Patchouli: Patchouli - Rosemary - Lavandin - Clary Sage. 2¼" wide by 6" tall - scented. ORDER NOW! CANDLES: Eco Palm Wax Pillar Candle, 2¼" x 6"
Eco Palm Wax Pillar Candle: Eco Palm Wax™ with organic palm wax. All scented pillar candles contain only 100% pure essential oils. 2¼" x 3½". ORDER TODAY! • Cranberry: Pure Botanical Extracts Lemon - Sweet Orange. 2¼" wide by 3½" tall - scented. ORDER NOW! • Holiday Spice: Cassia - Balsam Fir - Nutmeg - Clove - Orange. 2¼" wide by 3½" tall - scented. ORDER NOW! • Mountain Mist: Cedar - Rosemary - Canadian Fir - White Pine. 2¼" wide by 3½" tall - scented. ORDER NOW! • Vanilla Bean: Orange - Lavandin - Natural Vanilla Extract. 2¼" wide by 3½" tall - scented. ORDER NOW! • Lavender Hills: Lavender - Lavandin - Lavender Bulgaris - Orange. 2¼" wide by 3½" tall - scented. ORDER NOW! • Patchouli: Patchouli - Rosemary - Lavandin - Clary Sage. 2¼" wide by 3½" tall - scented. ORDER NOW! 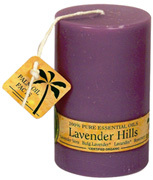 Eco Palm Wax Pillar Candle UNSCENTED: Unscented pillar candle made from 100% Eco Palm Wax™. 2¼" wide by 5" tall. ORDER TODAY! • White: Unscented. 2¼" wide by 5" tall. ORDER NOW! • Cream: Unscented. 2¼" wide by 5" tall. ORDER NOW! • Violet: Unscented. 2¼" wide by 5" tall.ORDER NOW! • Green: Unscented. 2¼" wide by 5" tall. ORDER NOW! • Red: Unscented. 2¼" wide by 5" tall. ORDER NOW! CANDLES: Eco Palm Wax Pillar Candle, UNSCENTED 2¼" x 6"
Flower Cylindrical Candle/Small: Decorated with dried flowers and scented with natural essential oils, these elegant candles make a wonderful gift. The natural fragrances evoke the joy of nature, the dried flowers add a touch of simple beauty. Fall leaves in this candle bring remembrances of a New England autumn. No artificial colors or fragrances. Guaranteed non-toxic. Small cylinder; ¾" x 2¾". ORDER TODAY! • Citronella: Fresh, grassy and warm-woody. Purifying and vitalizing. • Eucalyptus: Purifying and invigorating. • Jasmine: Calming, relaxing, sensual, and romantic. • Lavender: Balancing, soothing, normalizing, calming, relaxing, and healing. • Patchouli: Earthy, rich, sweet, balsamic, woody and spicy. Romantic, soothing, and sensual. • Pine: Refreshing and invigorating. • Rose: The fragrance of rose is associated with love. It is warm, intense, immensely rich and rosy. Romantic, supportive, and gently uplifting. • Sandalwood: A rich, sweet, warm, floral and woody aroma. Sensual, romantic, uplifting and relaxing. • Tuberose: Aphrodisiac, deodorant, relaxing, sedative and warming. • Vanilla: The aroma is lingering sweet balsamic. Calming, comforting, and balancing. • Ylang Ylang: An intense floral, sweet, jasmine-like aroma. Sensual and euphoric. CANDLES: Flower Cylindrical Candle/Small, ¾" x 2¾"
Flower Cylindrical Candle/Large: Decorated with dried flowers and scented with natural essential oils, these elegant candles make a wonderful gift. The natural fragrances evoke the joy of nature, the dried flowers add a touch of simple beauty. Fall leaves in this candle bring remembrances of a New England autumn. No artificial colors or fragrances. Guaranteed non-toxic. Large cylinder; 1¾" x 2¾". India. ORDER TODAY! • Geranium: Soothing, mood-lifting, and balancing. • Sandal: A rich, sweet, warm, floral and woody aroma. Sensual, romantic, uplifting and relaxing. CANDLES: Flower Cylindrical Candle/Large, 1¾" x 2¾"
Flower Pillar Candle: Decorated with dried flowers and scented with natural essential oils, these elegant candles make a wonderful gift. The natural fragrances evoke the joy of nature, the dried flowers add a touch of simple beauty. Fall leaves in this candle bring remembrances of a New England autumn. No artificial colors or fragrances. Guaranteed non-toxic. Pillar 2-3/4" x 3". India. ORDER TODAY! • Amber: Rich, complex earthy aroma. Grounding, centering and uplifting. • Cedar: Stabilizing, centering, and strengthening. • Cinnamon: Warm, floral-enhancing effect. Comforting and warming. • Musk: Rich, complex, spicy-floral and sensuous aroma. • Opium: An earthy, spice scent. Purifying, invigorating, cooling, relaxing, sensual, soothing, refreshing, and uplifing. • Orange Blossom: Strong, refreshing, spicy, floral aroma. Calming, soothing, and sensual. Flower Pillar Candle: Decorated with dried flowers and scented with natural essential oils, these elegant candles make a wonderful gift. The natural fragrances evoke the joy of nature, the dried flowers add a touch of simple beauty. Fall leaves in this candle bring remembrances of a New England autumn. No artificial colors or fragrances. Guaranteed non-toxic. Pillar 2¾" x 3". India. ORDER TODAY! • Sandalwood: Sweet-woody, warm, balsamic aroma. Rich, sweet, fragrant yet delicate, woody,. A rich, sweet, warm, floral and woody aroma. Sensual, romantic, uplifting and relaxing. • Spring Blossom: Uplifting and soothing. Flower Candle/Square: Decorated with dried flowers and scented with natural essential oils, these elegant candles make a wonderful gift. The natural fragrances evoke the joy of nature, the dried flowers add a touch of simple beauty. Fall leaves in this candle bring remembrances of a New England autumn. No artificial colors or fragrances. Guaranteed non-toxic. Square Pillar 1½" x 4¾". India. ORDER TODAY! CANDLES: Flower Candle/Square, 1½" x 4¾"
• 100% pure beeswax is the purest and most natural of all waxes. • Our candles have a beautiful Warm Amber Glow. There is nothing quite like the warm amber glow of a 100% pure beeswax candle. • Burning 100% pure beeswax candles can help improve indoor air quality by producing negative ions and can greatly reduce dust and other allergens in your home. • Naturally burns up to three times longer than paraffin. • Non-allergenic and recommended by the American Lung Association. 100% pure beeswax is best for those with allergies or sensitivities to scents. • The sweet honey aroma of 100% pure beeswax fills the air without added fragrance and dangerous toxins. They make an elegant addition to your home or as a special gift for someone you cherish! ORDER TODAY! • Pillar 3 inch: Most popular for ambience or candlescape. The Honey Candles® Pillar is the quintessential 100% pure beeswax candle for good reason. It is very long lasting and makes for a wonderful centrepiece for the dinner table or a pleasant evening by candlelight. On the first burn, let a wax pool form to the edge of the candle (approx 3-5 hrs). Burn Time: 35-45 ours. Measures 3 ½" x 3½". 1/pack. • Column 6 inch: The Column combines the best elements of Honey Candles® 100% pure beeswax pillars and tubes to create a truly beautiful candle. The Column’s large flame emits a gorgeous golden halo. Burn Time: 20-25 hours. Measures 6" x 1½" x 1¾". 1/pack. 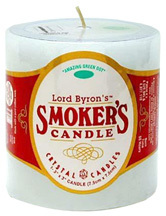 • Lord Byron's Smoker's Candle: Eliminate unwanted tobacco and any other household odors, naturally with our odor neutralizing candle. Our primary blend of citrus and wood oils don't just mask odors, rather, they neutralize odors naturally, leaving the air fresh and clean. 3". Burn time: 60 hours. ORDER TODAY! The unique coloring of the candles is on the exterior, so it won't interfere with the candle's burn. We insert the wick through the center of the candle body for an even, dripless burn. The candles are made with a high melting temperature wax in a compression molding process to create a dense candle that will hold up in the heat.